I’m very honored to be showing my encaustic, mixed media artworks alongside 5 other artists who also work with recycling found objects for a celebration of Earth Day and as a reminder to recycle. Dale Youngman of Castelli Art Space Gallery at 5428 W. Washington Blvd. in Los Angeles has put together an amazing group of talented artists for her curatorial debut as director at one of LA’s established and iconic galleries. I’m excited to announce my participation with Rebecca Molayem Gallery this year at the International Fair, LA Art Show. I’ve shown my artworks with Rebecca Molayem Gallery at her beautiful loft style space in Los Angeles for a few years now. In 2017, our exhibit at Spectrum Miami for Art Basel, won “Best New Exhibitor” out of over 200 galleries. I can’t wait to see what’s in store for us this year at The LA Art Show! For this year’s exhibition, I’ll be sharing several new artworks, including “Any Way The Wind Blows” a sculptural painting that features a found object metal piece in the horizon. Can you guess what it is? Some of my most favorite paintings are the ones where I’m inspired to repurpose cast-off found objects into the work. I often imagine these abandoned curiosities breathe new life into my paintings giving them a soul. I’m looking forward to the response of this latest artwork, in addition to several other recent paintings, I’ll be exhibiting this year at The LA Art Show. You are cordially invited to come enjoy a day of exploring artworks from artists represented by 100 plus galleries from around the world. 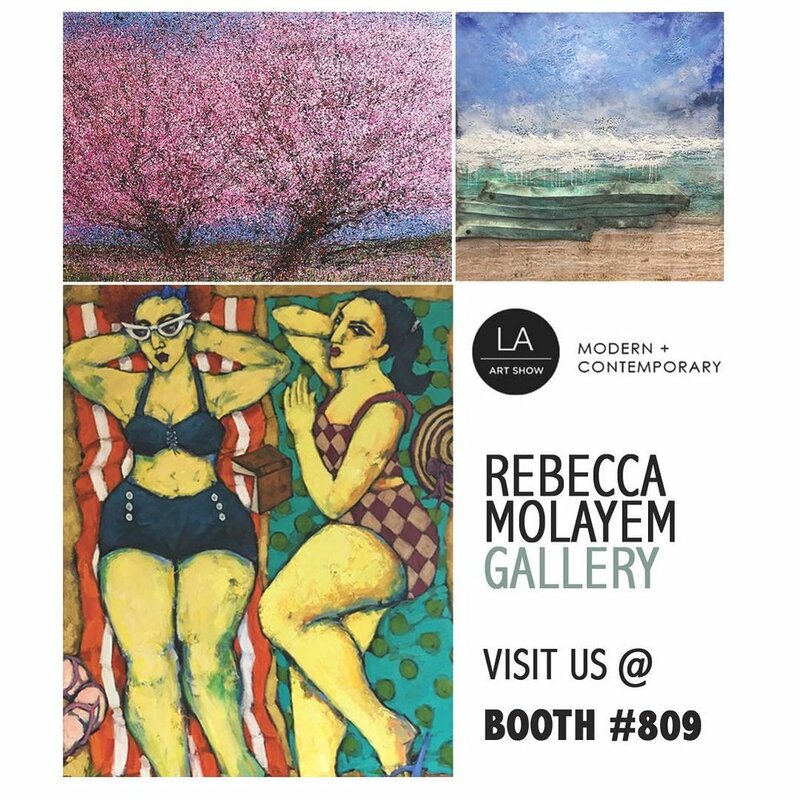 Please stop by our booth #809, Rebecca Molayem Gallery, Los Angeles, and say hello.